Wader Quest: AWSG Whimbrel tagging: Long-haul flight home. 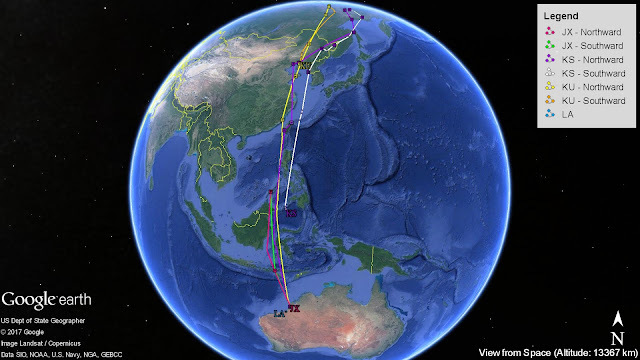 AWSG Whimbrel tagging: Long-haul flight home. One of our Whimbrels from the breeding ground is on its way back home! 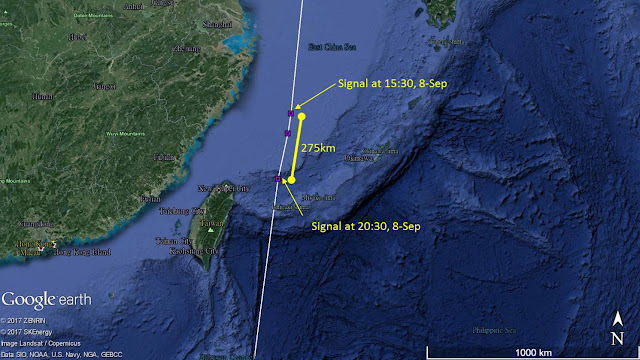 After staying and replenishing at North Korea for 23 days, KS made its move on 6-Sep evening. KS has flown 3,671km non-stop for 4 days already and is currently located between Borneo and the Philippines. With the aid of a southerly wind, KS is flying home with an average speed of 38km/h. Based on two satellite signals on 8-Sep, it has even flown at a speed of 55km/h for 5 hours! KS is currently about 2,500km away from Broome. If it continues to fly without stopping, it is expected to be home within 3 days time. Meanwhile, KU is spending its 35th day at Yingkou, Liaoning Province. We are expecting it to start migrating south very soon like KS. We are still receiving regular signals from JX and LA from Broome and Eighty Mile Beach. Another update will be sent out as soon as KS reaches home.